Ruth had plans to flee with her Jewish family from Vienna before the Nazis reached the city. Her family made it out in time, but not Ruth. Her father’s young colleague Quinn finds her and resolves to help. After exploring their limited options, they agree to marry so she can leave with him as his wife. The plan is to annul the marriage once she’s safe, but they quickly learn such a fast annulment will call the validity of the marriage into question and may send Ruth straight back to Austria. So instead they intend to carry on with their separate lives until such time that a divorce makes sense, except Ruth enrolls in university and finds herself taking Quinn’s classes, which makes not seeing him significantly harder. I found this Ibbotson novel especially humorous. Ruth and Quinn both go to extremes trying to avoid each other. Meanwhile, as a young prestigious professor, Quinn is considered quite the catch and other young women are doing their very best to get and hold attention. Oh, and did I mention Ruth already has a fiancé? She and Quinn both agree to keep silent on exactly how he smuggled her out of Austria, so Ruth’s family and fiancé have no idea she’s technically a married woman now. I enjoyed the chemistry between Ruth and Quinn. Ibbotson has a knack for writing romances where characters are drawn to each other not because they have exactly the same views but because they’re intrigued by each other’s different views. Quinn and Ruth argue over near about everything, but then each is left musing over the other’s points. As with Ibbotson’s other young adult historical romances, the heroine is a classic Mary Sue trope. Everyone either adores or detests Ruth and if they detest her that’s a sure measure they’re a bad character. She’s sweet to the point of naivety and always aims for perfection of character. 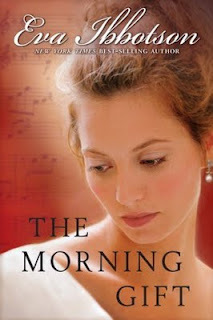 With THE MORNING GIFT, Ibbotson crafts another sweet and funny romance against the backdrop of real historical issues. Sadly, I’ve reached the end of reviewing all of her young adult novels, but I still look forward to reading her middle grade work.